MicroRNAs are small noncoding RNA molecules with great importance in regulating a large number of diverse biological processes in health and disease. MicroRNAs can bind to both coding and noncoding RNAs and regulate their stability and expression. Genetic variants and somatic mutations may alter microRNA sequences and their target sites and therefore impact microRNA–target recognition. Aberrant microRNA–target interactions have been associated with many diseases. In recent years, computational resources have been developed for retrieving, annotating, and analyzing the impact of mutations on microRNA–target recognition. 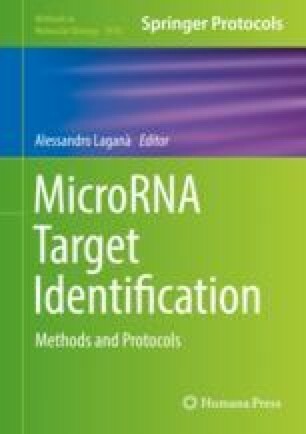 In this chapter, we provide an overview on the computational analysis of mutations impacting microRNA target recognition, followed by a detailed tutorial on how to use three major Web-based bioinformatics resources: PolymiRTS (http://compbio.uthsc.edu/miRSNP), a database of genetic variants impacting microRNA target recognition; SomamiR (http://compbio.uthsc.edu/SomamiR), a database of somatic mutations affecting the interactions between microRNAs and their targets in mRNAs and noncoding RNAs; and miR2GO (http://compbio.uthsc.edu/miR2GO), a computational tool for knowledge-based functional analysis of genetic variants and somatic mutations in microRNA seed regions.